Rebel military group the M23 movement  has made headlines by entering into open conflict with the Congolese army , but it is not stopping at armed conflicts on the ground; the rebels have also gone on the offensive on the Internet and social networks. M23 is demanding complete application of these agreements and began to go underground in April. But the conflict is more complex than that. The spark that ignited the cause was lit by Kinshasa when he decided, under pressure by the international community, to arrest Bosco Ntaganda, an ex-CNDP [National Congress for the Defence of the People militia] and a member of the regular army who had been made a general at the 2009 peace accords. According to Faustin Munene, who has been opposed to Joseph Kabila since 2010, the Congolese president is the main party responsible for the renewed violence in North Kivu. In an interview with Afrikarabia, the head of the ARP [French initials for Popular Resistance Army] also confirmed that alliances were being formed on the ground between the various armed groups in the eastern part of the country. The one person responsible for this explosion in the east is named Joseph Kabila. [There are] several reasons for that: his poor governing and the establishment of a dictatorial regime with no social justice. This is a regime that has taken all institutions hostage. He is entering into secret agreements that commit the republic, he is making decisions on his own, no one knows what he is doing. Photo of Congolese army soldiers published on M23's Facebook page. The Congolese are victims of their hospitality. 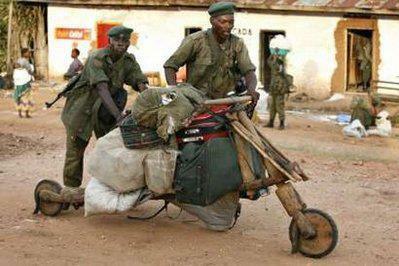 We should chase out the M23 terrorists with their accomplices. It’s a matter of life and death. ‎@Cokotracy Mirindi: you bloodthirsty people always use the same talk. Self-defense, self-defense….A pretext for revenge and killing the Bantus. As if only you Tutsis should defend yourselves. The US government has decided to suspend its military aid to Rwanda due to the African country’s support of an armed uprising in the Democratic Republic of the Congo (DRC) next door. This aid, a sum of US$200,000 (164,000 euros) was intended to sponsor a Rwandan military academy for noncommissioned officers. “The United States government is gravely concerned by the evidence that Rwanda is involved in providing support to Congolese rebels, including M23,” stated Darby Holladay, a spokesperson for the State Department. Several villages and neighborhoods in North Kivu are under M23 control. However, heavy fighting continues between the FARDC (Armed Forces of the Democratic Republic of Congo) military and M23 mutineers to stop the M23 from taking control of Goma, the province’s capital. Imagine a country where the soldiers at the front are on their own for survival, funds intended for supplies often vanish before reaching the troops, inevitably encouraging the soldiers to steal or pillage. These poor boys are left to their own sad devices…. We have learned that this herd of failed soldiers dress as civilians after they’ve stolen goods from the people they meet on the way to seeking shelter. This notion is widely debated by Facebook users. Actually, the pay for a general in FARDC is US$ 100 and US$ 45 for an ordinary soldier. Rations are US$ 5 for soldiers at barracks, US$ 10 for those at the front. All I can see are a bunch of Rwandans in all these comments… And all the M23 soldiers are just Rwandans, why are they declaring themselves Congolese when they aren’t? dear compatriots, the time has come to join forces as one people, let’s kick these Rwandans who call themselves Congolese out of the country. Too bad we’re not paid for the time we spend trying to understand Africa, and the brain cells used, we could make a career out of it. When M23 talks about unpaid soldiers, they are the ones who were commanders of major units in the region, explains Col. Hamuli. They were responsible for the soldiers’ pay that they were embezzling, as well as the munitions. They embezzled everything, and gave reasons that don’t hold water. And blaming all of that on the Congolese government today is absurd and laughable. The real reasons for their mutiny lie elsewhere.